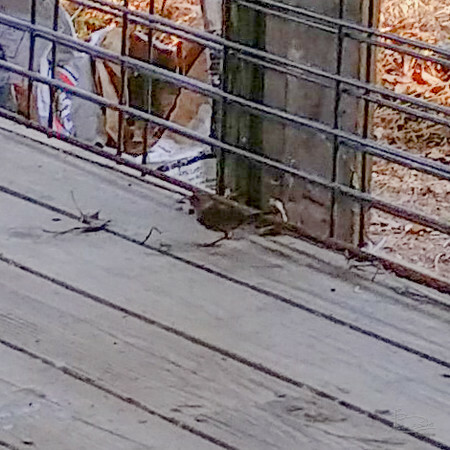 I was sitting on the south deck and this little grey bird flew up and perched on the deck fence and looked at me and was apparently dining on some kind of nutrtion that is was finding on the 1/4 inch wires. Not rubbing his beak, but touching it to the wire. By the time I got my cell phone out and the camera software started, he'd hopped further down the fence. The lighting conditions were terrible due to very brigh sunshine out on the lawn and very dark shade under the porch roof. Still and all, the cell phone records enough photographic information that with post processing "push" and cropping that one who knows their birds can probably identify it. 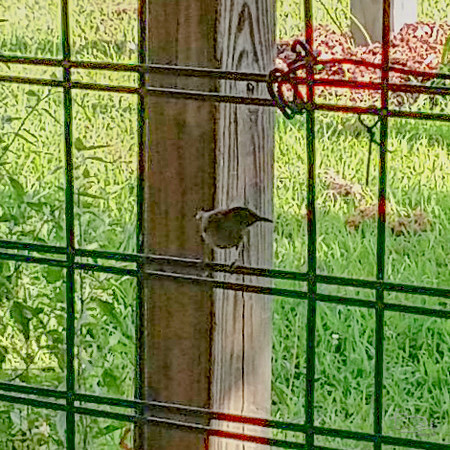 By the time I got the cell phone camera up, he'd flown further down the fence. I thought about using the "zoom" on the camera, but since it is not an optical zoom, may as well go for good exposure and crop the photo after. Due to the large difference between the bright sun on the lawn and the solid shade under the porch, I had to take fairly drastic measures with the tone curve, highlights, shadows, white and black clipping to get something clear enough to identify the bird -- if I knew birds. However, if this species is only different from other little grey birds by pin feather count, or subtle refinements of color, this photo won't make it. In the first photo, he or she is watching me from the right. 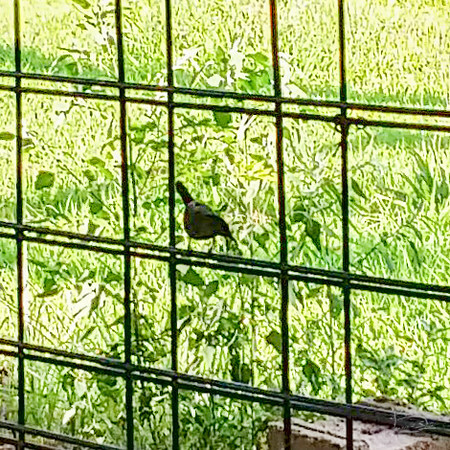 I don't know what this bird was eating, but he apparently was finding something on these 1/4 inch wire mesh panels. He kept dipping that long beak down and touching the wire and later the floor. 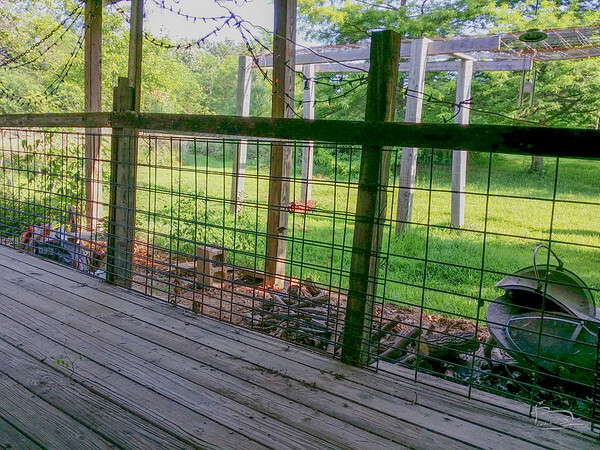 In thinking about sitting out on this deck, there do seem to be invisible things flying around, landing on me. Not biting or stinging, but not really all that pleasant either. There are also mosquitos, and their presence is a lot more obvious. He was clearly aware of my presence, but didn't seem alarmed.  Not quite as "friendly" as the sparrows that visit me when I'm dining at International cafe's outisde dining area. I don't know if he was aware of the cat about 30 feet away, out in the sunshine. The cat was interested in something in the grass nearby, though, and didn't notice the bird. Or more likely just ignored it. Without the post behind it, the contrast between the dark bird and the bright sunlight was too much for the cell phone. In fact it would probably be too much for any point and shoot, and is almost impossible even with a fancy DSLR with all kinds of controls. When I push post processing cuves too far, color shifts begin to occur where the light is reflecting off something subtly different. The blue and red were not in the colors my eyes were seeing. On the other hand the shade of grey on the chest looks about right. Flies down to the deck floor. From here he hopped around, pecking here and there. After a minute or two, flew to another perch on the fence and shortly after disappeared up into the oak.